Hey everyone! So once again I'm starting off this post with an apology for being such an awful blogger! Full time work really is getting the best of me at the moment and as I do mainly late shifts I rarely have time to eat a proper dinner let alone blog however I am going to be managing my time a lot more efficiently and getting posts written up in my spare time so there isn't a huge gap between posts on my blog. I've lots of ideas in my head and not enough time to execute them so please forgive me! Now that that long rambly intro is out the way let me get back to what this post is all about! 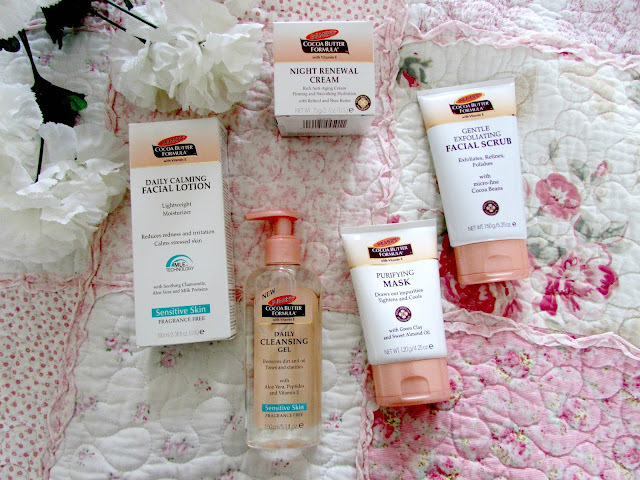 When it comes to skincare I've never really been one to have a stable skincare routine. 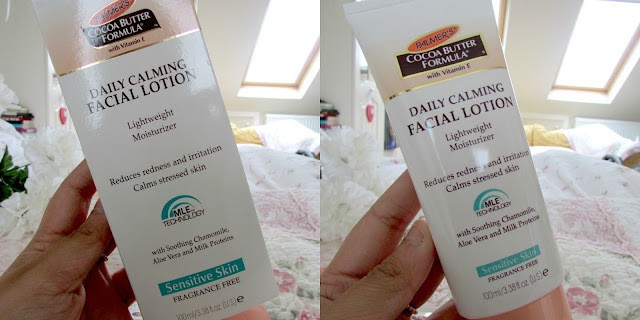 I am always trialing and testing new products and always use things on different days so there's never really been one brand that I've fallen in love with that I've felt I need to repurchase again. However in the past couple of months one brand I absolutely can't get enough of is Palmers. 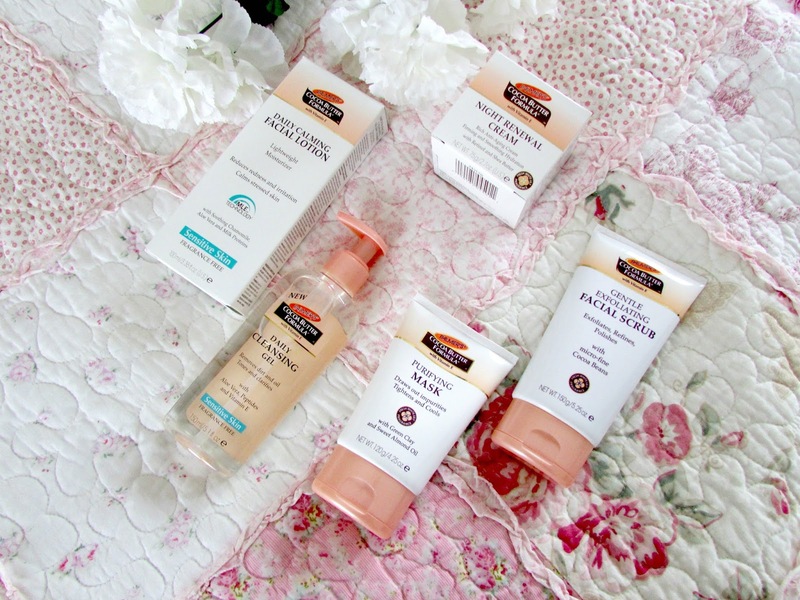 Palmers is a brand that I've always loved because I just love the way their products make my skin feel so I decided recently to test out quite a few of their products and these are the ones that I've absolutely fallen in love with. Keep reading to find out why. 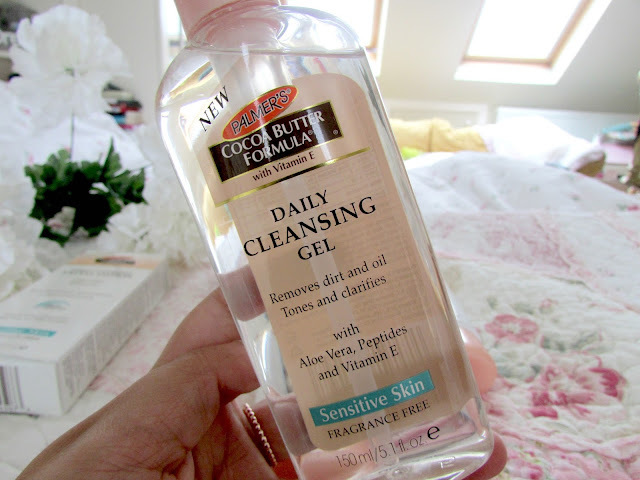 I've never really used a cleansing gel before. I either use cleansing cremes or cleansing waters but never really a gel so when I spotted this in Superdrug I was instantly intrigued. I must say though I am thoroughly impressed. A little definitely goes a long way with this product. I find a small pea sized amount does my whole face and allows all the dirt and grime to be removed from my face. It does tend to get a bit foamy once water is applied but I don't mind that. I also find that this is incredibly gentle on the skin and doesn't irritate it which is what I was afraid of happening before I used this. 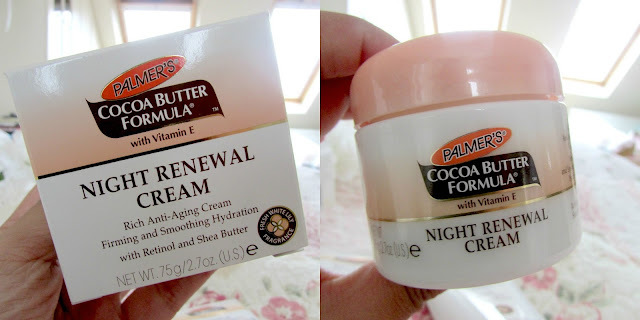 Normally Palmer's products contain the signature cocoa butter scent but this didn't actually have that. The scent is more of a soapy scent which isn't too strong but at the same time I think it disagrees with the whole fragrance free claim on the bottle. However I just love this cleanser and it's definitely going to last me a long time and become a staple. Facial scrubs have always been something I've had a love/hate relationship with. Some are incredible and others really have damaged and irritated my skin in the past. However not this one. I absolutely love it. It does everything it says on the bottle, exfoliates and removes all the dead and dry skin, refines it and polishes the skin leaving it really soft and smooth which I love. 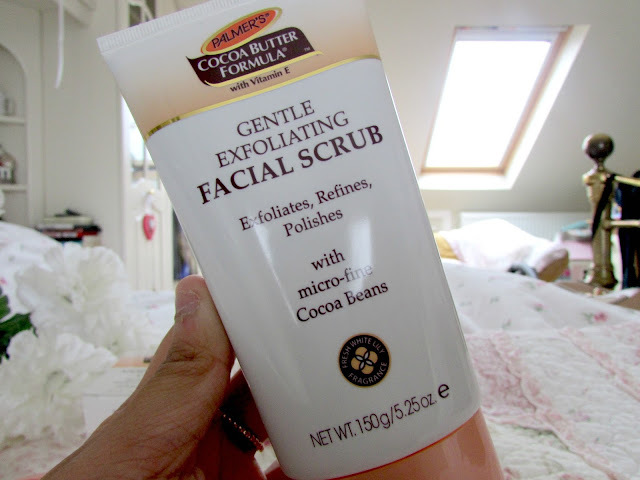 There is definitely a noticeable difference to your skin once you've used this so I'd highly recommend this if you love facial scrubs or looking for a new one to try. The cocoa butter scent is definitely an added bonus to this product too. I just love it. If you follow me on twitter and have been for quite a while then you will know how difficult it is for me to find a decent face mask. I'm always on the look out for new ones to try as I have never really been able to find one that suits my skin and does the job I'd like it to do. However I think I may just have found my new holy grail one. 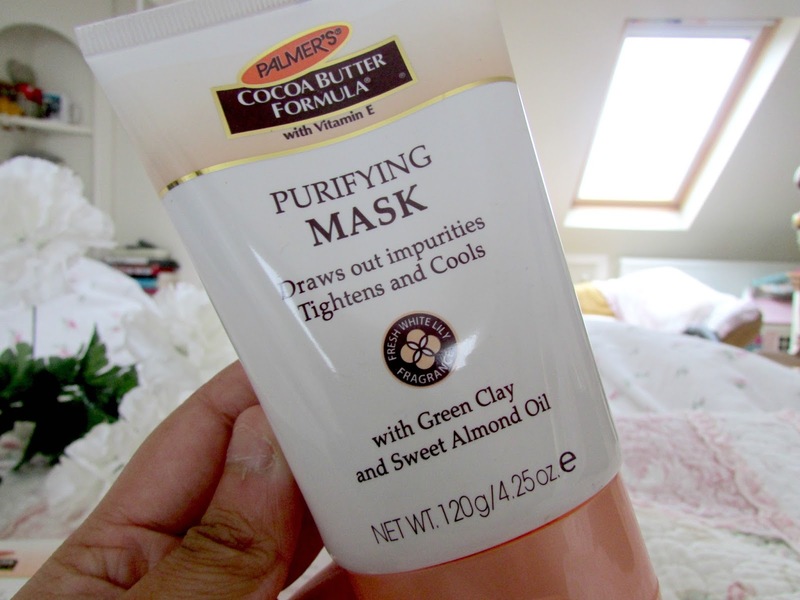 This mask is incredible and I think that solely down to the ingredients. I love the fact that this has Sweet Almond Oil in it as this ingredient really nourishes the skin and make it appear a lot healthier. I love the fact that it gets rid of anything clogging up those pesky pores as well and I love that it leaves my skin feeling and looking incredible soft and smooth. I tend to leaves this for around 10-15 minutes on my face twice a week as I think this produces the best results. Again I love the cocoa butter scent. This is definitely a face mask I'll be repurchasing more often as it's incredible. This is probably my favorite products of everything listed in this post. I absolutely love this moisturizer. Not only does it leave my skin feeling incredibly hydrated but I also find it leaves me looking less tired. Now that I've started working for BA full time I get tired really easily and it definitely takes a toll on my skin but this moisturizer definitely makes my skin appear a lot more calm, less red and a lot less irritated as well. I love using this underneath my foundation too as I find it provides the perfect base and it's quite cooling as well which makes it perfect to use first thing in the morning as it definitely wakes me up. Yes I know I am only 24 and that this is anti-aging but the way I see it the sooner I use it the longer I have to wait until my skin starts showing my true age! I absolutely love this moisturizer though. I love how thick and moisturizing it is. I can still feel it on my face when I wake up the next morning which I love. It leaves my skin feeling a lot firmer, smoother and makes it a lot more radiant as well. I love that it has shea butter in it as that is one of my favorite skin care ingredients. It is definitely one of those drugstore products that actually feels really luxurious on the skin. I absolutely love it and would highly recommend it. What is your favorite skincare brand? Hey Everyone! Hope you are all well and are having a lovely October so far! I can't believe I actually just wrote that. How on earth is it October already? It's hard to believe that this time last year I only had a month left working in Turkey. I can remember everything that happened last year so clearly. Hard to believe 12 months have gone by since then. But anyway enough rambling. Today I thought I would talk to you about some of my favorite fashion bits and pieces I've spotted on various websites at the moment. Autumn and Winter fashion is definitely my favorite fashion out there. I just feel so much more comfortable in coats, long sleeved shirts, jumpers and skirts with leggings so I thought why not introduce you to everything I'm desperate to get my hands on at the moment. I absolutely love jumpers and burgundy at this time of the year and I absolutely love the style of this jumper. I think it will go with absolutely everything in my wardrobe. The length is also something I really like as well. Recently when I've been looking for jumpers everything seems to be cropped and that's probably the least flattering style ever in my opinion. I really dislike cropped things I think longer styles suit my figure better. Definitely one I will be buying in the near future. I saw this dress on the river island website and absolutely fell in love with it. I love the top and skirt combo and the fact the skirt is burgundy and the fact that the top is turtle neck. It's literally the perfect autumn outfit and will look absolutely stunning either on a night out or during the day. It's such a versatile outfit and I love it. So you know I said I have a bit of an obsession with all things burgundy at this time of the year? I wasn't kidding. How beaut is this jacket? I am yet to find a coat that I can wear most days this Autumn/Winter and I think I may have just found it. I've actually never purchased anything off ASOS before but this coat is an absolute beauty and I love the fact it's different to my normal decision of black or navy blue. When I found out the gorgeous Binky from Made In Chelsea was releasing her own clothing line I was extremely excited as I adore her fashion sense. Having looked on the in the style website at her collection all the pieces are extremely pretty and definitely stuff that I would wear. I was instantly drawn into this gorgeous khaki coat. It's not normally I style I would pick up but I've decided that this season I will become a bit more daring with my fashion choices. Definitely looking forward to picking this up soon! I'd highly recommend checking out the rest of Binky's collection as there are some gorgeous pieces there. This is another coat I have my eye on this season. It's just one of those coats that will go with absolutely everything and will look perfect in the evening or during the day. This is normally the style of coat I opt for every single year which is why I've decided to opt for a few different ones that I've mentioned above but I just love everything about this one too so I think I'll definitely be purchasing this one too. I won't lie here and say that I have a bit of an obsession with checked shirts. I just love them and I was particularly drawn to this one purely because it reminded me of Harry Potter. It just had that Gryffindor look about it. I just loved it and I think the colors are definitely perfect for the autumn season. How gorgeous is this skirt? I'm not normally a skirt person but this is beautiful. I love the color as I think it definitely brightens up the dark and dreary days of Autumn and Winter. I also think the velvet look is so beautiful as well and I know this paired with a nice little top, tights and boots will look so classy and pretty on evenings out. I'll definitely be purchasing this after this post I think. Oh look, another checked shirt. Whoops. Again I love the color scheme of this one. I love the blue green combo and I think it's another shirt that will go with absolutely everything in my wardrobe from jeans, to trousers to skirts. I absolutely love it. 99.9% of my wardrobe is actually checked shirt but hey another one won't hurt right? So these are all the items that I am currently lusting and drooling over. I am definitely going to be ordering a couple of these items in the next couple of weeks and I've decided to do some outfit posts for autumn/winter on these blog too. If that is something you'd be interested in seeing then let me know in the comments below but please go easy on me as I'm just a tad self conscious. Be sure to click on the names of each of the outfits to head on over and peruse them. What is on your A/W Fashion Wishlist?